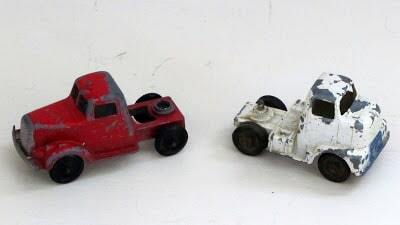 I was cleaning out my son’s closet this week to see what new clothes he’ll need for school and I ran across these old cars that I had brought home from my Mom’s house a few years ago. Most of them were my older brothers’ toys. I had just thrown them in the back of my son’s closet previously, but I pulled them out and dusted them off and decided to display them in his room. 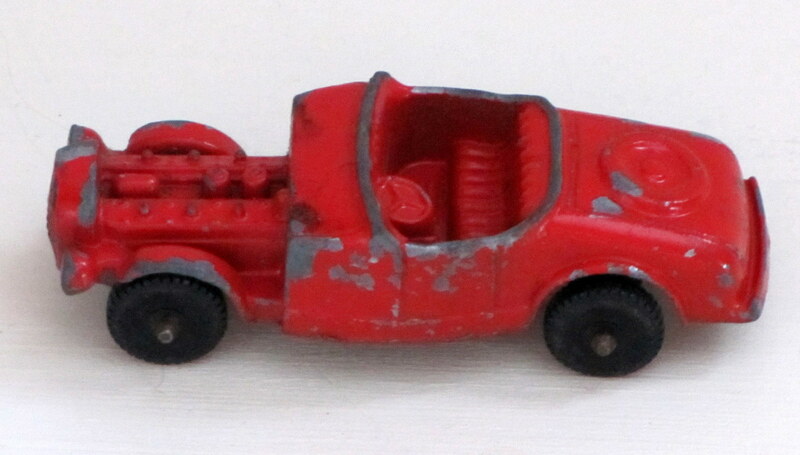 I like the chippy paint on them and the vintage styling. 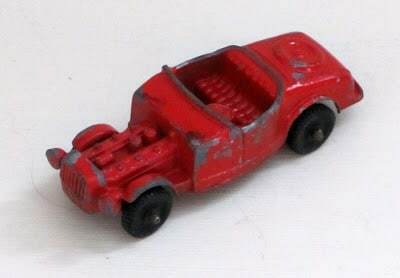 I would guess it is from the 1950’s because that would match with my older brothers’ ages (not mine, I’m from the younger wing of the family). Look at this cute vintage catalogue I found at Structotucks.com. This red fire engine is made of a rubber-like material and just says Made In USA on the bottom, so I’m not sure of the manufacturer. This forklift also has no manufacturer, but it is made of the same type of rubber. 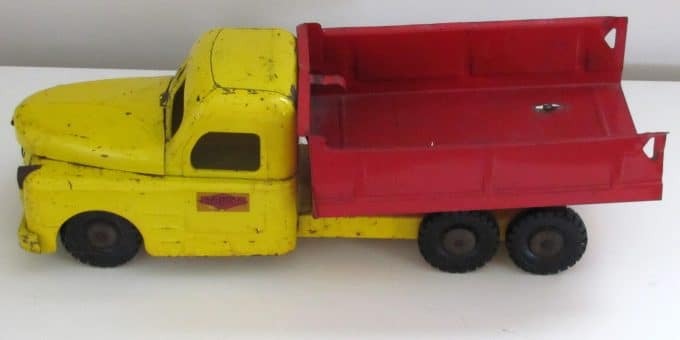 Both of these truck cabs say Tootsie Toy Chicago 24 USA on the bottom. 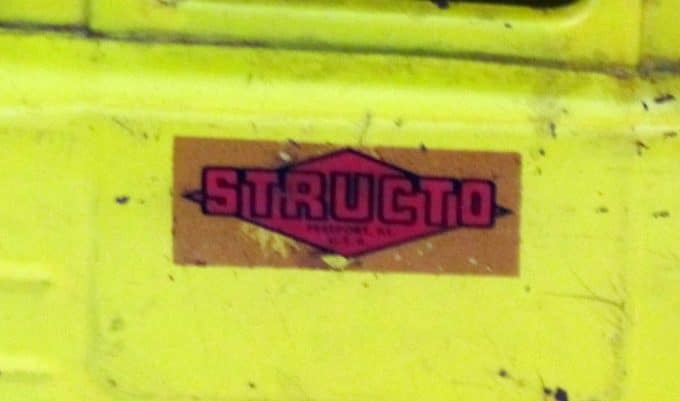 They have long ago lost their trailers. 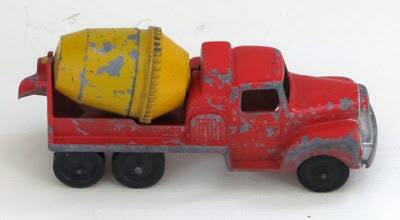 This cement mixer also says Tootsie Toy Chicago 24 USA and has the number P-10290 on it also. 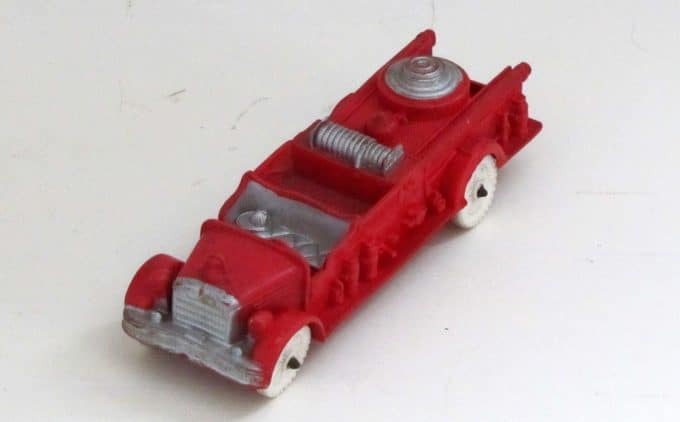 Another Tootsie Toy and this one says Model B on the bottom. This one is much, much smaller than the other ones – approximately 3″ long. 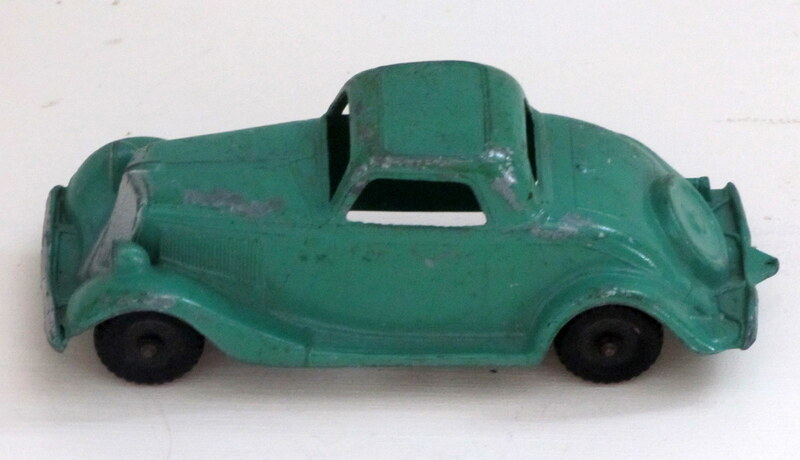 This cute green car says Hubley, Lancaster, PA, Made in USA, 404 on the bottom. 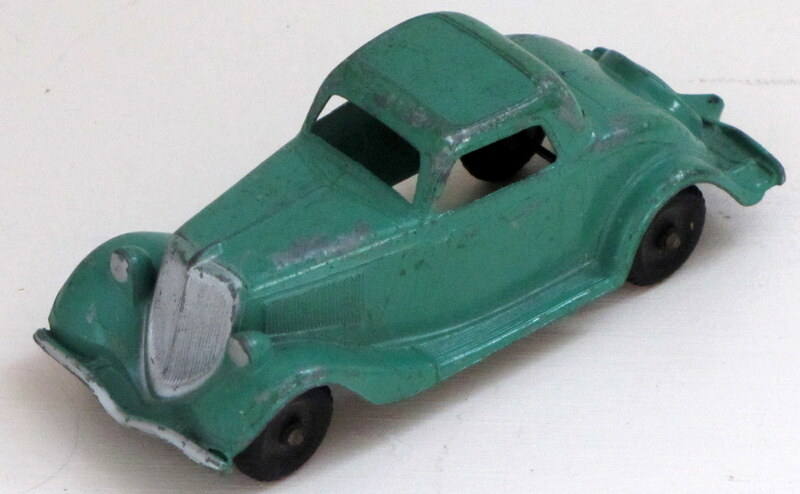 From research I believe it is a model of 1933-1934 Ford Coupe, but would have been made in the 1950’s. This blue car also says Hubley, Lancaster, PA, Made in USA, 401 on the bottom. My best guess would be a Lincoln sedan. 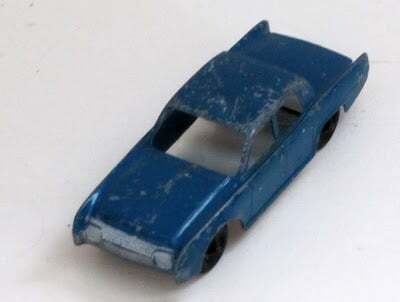 OK, my husband’s best guess was a Lincoln sedan, my best guess would have been “a blue car”. And last, but not least – drum roll please . . . 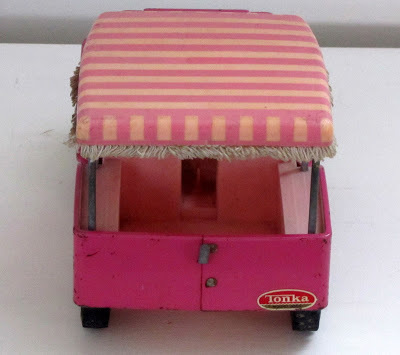 This is my very own Pink Tonka Jeep Surrey from my childhood! 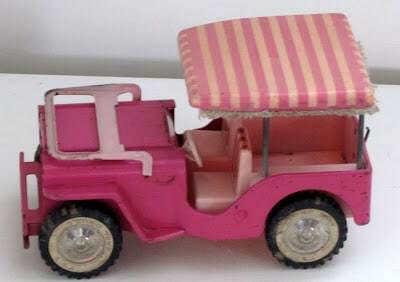 The windshield folds down just like a real Jeep. 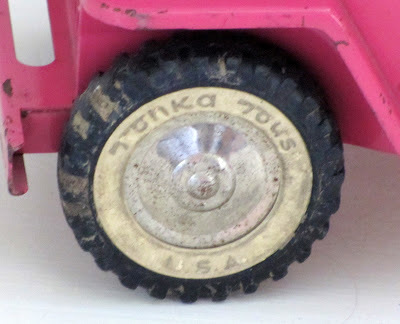 Tonka manufactured this in 1962. 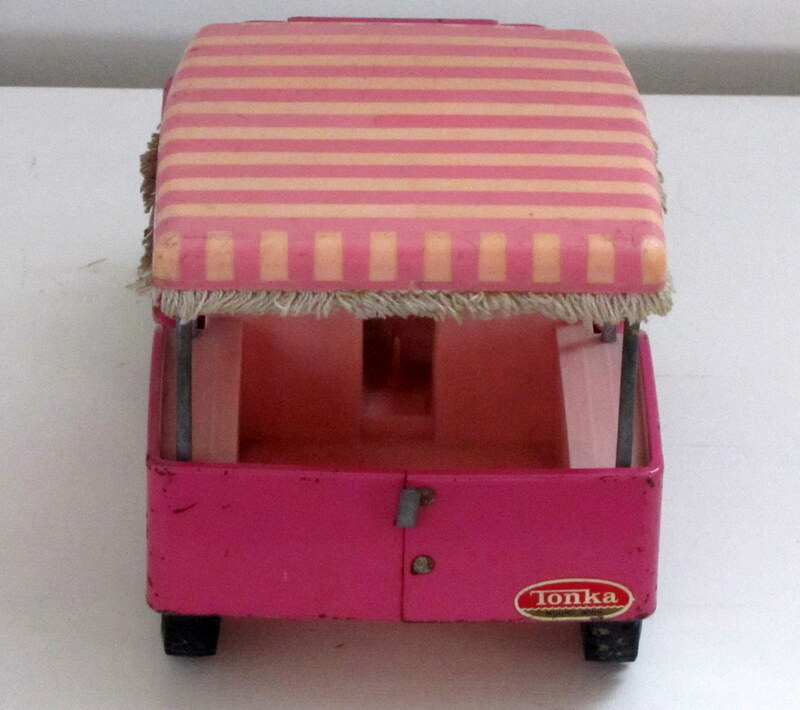 Now considering girls in my hometown were not allowed to wear pants to school until 1968, I’m sure it was sort of radical that Tonka was producing a traditional boy toy marketed toward girls at that time. It has cute fringe on the top. 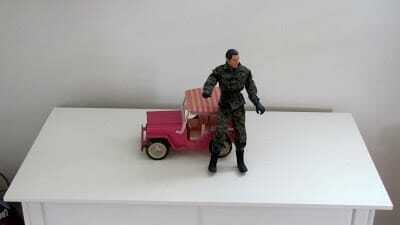 I used to call this my Barbie Jeep, but as you can see it’s not really the correct size for a Barbie. 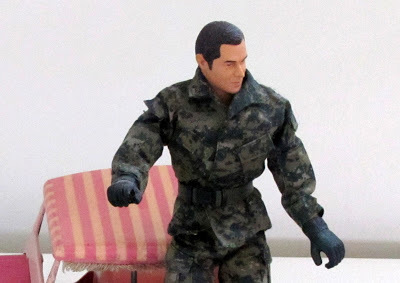 Well, I couldn’t find any Barbies in the house, so I had to use a G.I. Joe look alike to show you the scale. 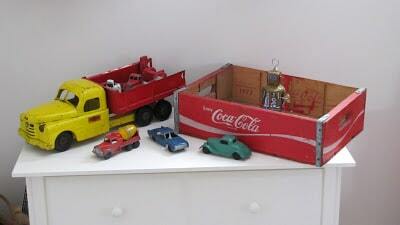 Now, I started out saying I had decided to display these in my son’s room and I loved the chippy paint on them. But when I was handling these and flipping them over to see what they said on the bottom just now, I looked down into my lap and there were little flakes of different colored paint on me. I’ve since started twitching and foaming at the mouth (kidding), so now I’m going to box them back up until I can research if they have lead paint on them and if so, what I need to do to keep the paint where it is. 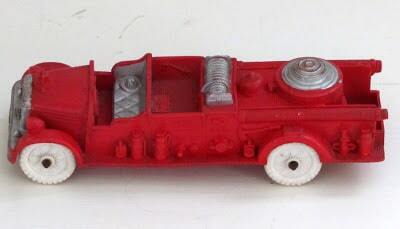 This isn’t something that my son would ever play with anyhow, but we still have to be careful don’t we? Such a nice walk down memory lane. 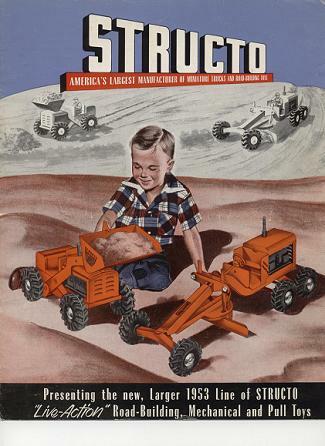 I doubt you could go to a toy store today and find that many toys made in the USA. 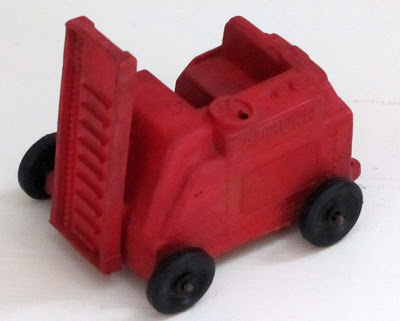 I had to chuckle at the sharp metal edges on the dump truck. Timees sure have changed. Love the old cars We had a few of those around our house too. 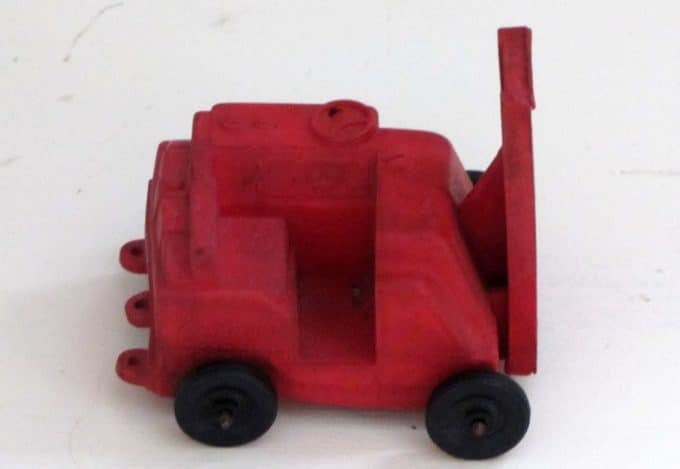 I also have my father-in-laws wonderful big truck and grader He was a child in the 30’s and I don’t think the thing was ever played with-it is mint…I just passed it along to my son (his youngest grandson). Those are great! I wonder if a coat of clear poly would work to keep the paint from chipping. That’s what Tamarah over at Shabby Vintage Junk uses on all the chippy rusty stuff she finds. Love the cars, but I especially love the pink Jeep. 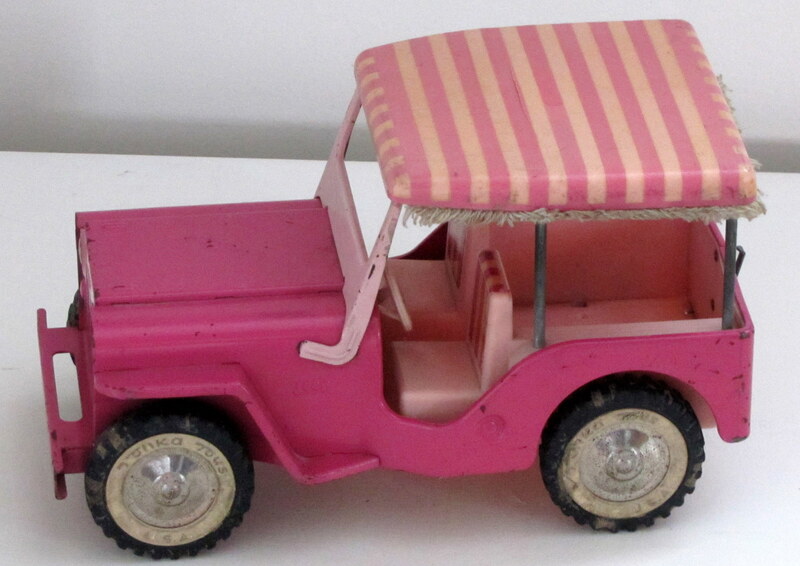 It reminds me of Connie Steven’s Jeep in Hawaiian Eye, a television series from the 60’s. Fun, fun! Thanks so much for popping in to see my kitchen. how cool!!! 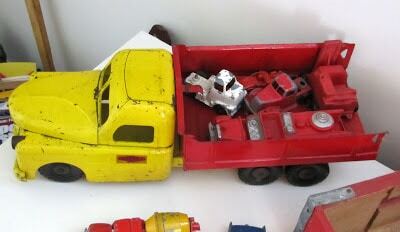 I love old metal toys!!!! You have some wonderful vintage toys there. I would suggest you get them cleaned up and put in a safe place. These are very pricey if you could find them. Boy they look familiar. My older boys had toys just like that and the little Barbie things too for the girls. You have a valuable collection there. A great post. Great memories. They look like fun. Love the pink surrey. Too cute. I have a brother-in-law who collects those old toy cars. You’ve got some great old toys here, and I enjoyed seeing them all! 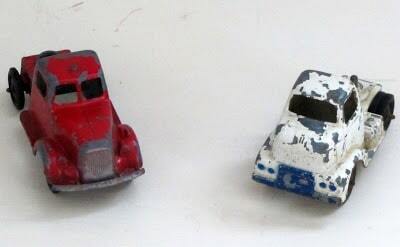 They look just like my brothers’ cars, with the chipping paint and all. These are just wonderful! 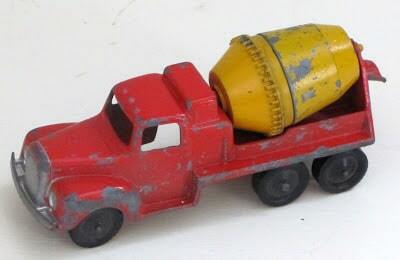 I love old toys and these are really fantastic. I’d think about displaying them in a glass case- that would keep the paint out of the air! I just love vintage finds!! These are great! I’m happy to be your newest follower and would love to have you visit Frou Frou Decor..I love new friends! I’d also like to invite you to link up to my party every Friday..for Fabulous Friday Finds…anything from creative finds to recipes..crafts, etc. 😀 Hope to see you there! Hi Pam-Thanks so much for following my blog. I am following yours now, too. Anybody that likes a good garage sale is a friend of mine. I’ve been going to them for 30 plus years! My b and b is under a mile from the beach-not right on it, but close enough! 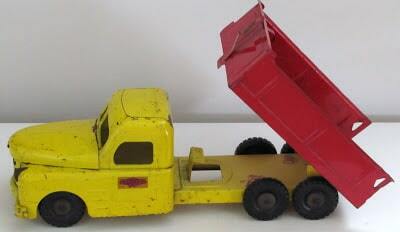 I remember playing with metal dump trucks in the 1950s, but I never had any trucks of my own. 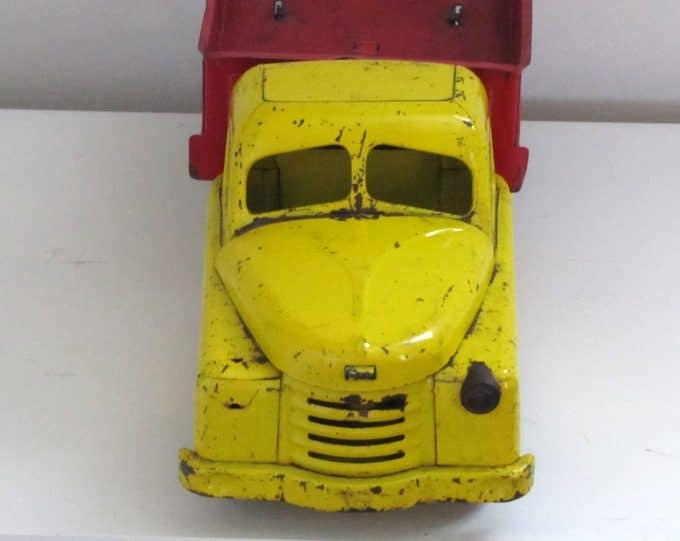 They are beautiful, bearing as they do the marks of childhood playtimes and plenty of use; toys are so much better when they are a bit battered up, don’t you think? You are wise to be cautious about the flaking paint, thought — good mom! I hope you are able to display these. I love the chippy paint, but I’d be a bit nervous about it, too. Great post.